Here is another Hyper Hobby mail away item. 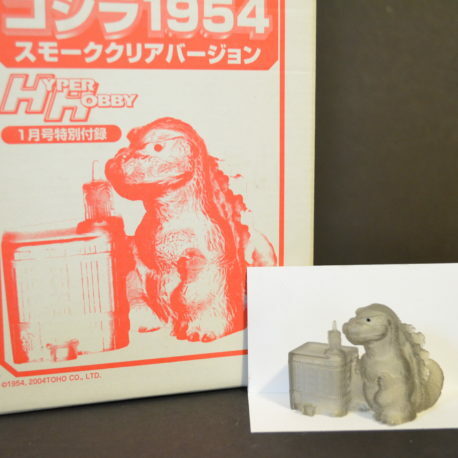 It is the super deformed Godzilla 1954 style-the original King of the Monsters. He stands about 1 1/2 inches and is translucent gray. He stands over the Diet Building. Comes in original box. 81 pages of beautiful color photos of the film, outstanding black & white photos of the making of the film, sketches of the production designs, sketches of the super weapons and interviews with the cast and crew (all in Japanese). Included are photos of early Godzilla films and a breakdown of each movie along with a picture of the posters for the movies. This is an awesome book, we especially like the detailed photos of the making of Godzilla X Megaguirus 81 pages of beautiful color photos of the film, outstanding black & white photos of the making of the film, sketches of the production designs, sketches of the super weapons and interviews with the cast and crew (all in Japanese). Book dimensions 11 1/2 inches by 8 inches. This book is written by the Japanese author known as Taki. The dimensions; 10 x 8 inches. 58 pages of exciting color and black & white photos of the movie and production. This wonderful book also contains great close-up photos of all of the monsters including “KAMEBA”! A centerfold map shows where each of the epic battles takes place! 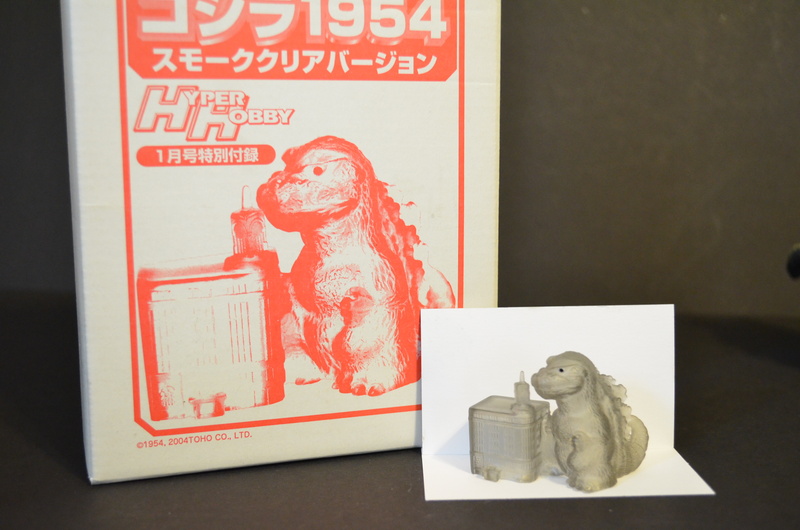 14 black & white pages contain photos, information and drawings from earlier Toho Kaiju films. 15 colorful pages are of photos of “THE MAKING OF GMMG Tokyo SOS”. This section has fantastic shots of behind the scene action as well as close-ups of the making of the monster suits. This is one action packed book! DIANE was at the JAPANESE premiere of the LATEST GODZILLA 2014 Movie in TOKYO. OUR apologies that We have not been able to take photos. HOWEVER this book is truly a WONDERFUL collectors book in JAPANESE with many behind the scenes action photos and GREAT photos of all the actors: KEN WATANABE, BRYAN CRANSTON, AARON TAYLOR-JOHSON and others. There are so many exciting photos of the making of the movie and also a shorter essay on the history of GODZILLA. The book is 80 PAGES. This is the OFFICIAL Book for the JAPANESE Premiere so it is in JAPANESE but there are so many FABULOUS photos, TRUST CLAWMARK that is is a GREAT collectors item. GODZILLA, MOTHRA, KING GHIDORA ALL OUT MONSTER ATTACK! Awesome 98 mostly full color pages of behind the scenes and special effects photos from the movie Godzilla, Mothra, King Ghidorah All out Attack. It has lots of wonderful photos including suit designs! There are interviews with Tomiyama, the producer, Kaneko, the director and all the major cast and crew (in Japanese). It is a fascinating and ACTION PACKED look at the making of the movie. Book dimensions 8 by 11 ½ inches, soft cover by Sonorama. NOW OUT OF PRINT!